Universal Programmer Tester PR-02 - Device supports more than 7000+ devices. Our Testers are offered with 48 Pin ZIF socket with universal pin-drivers to supports 8-pin to 40-pin DIP package device, USB Interface to LAPTOP & PC, High speed programming, Cost effective Hardware and Flexible Software, Top-3000-Universal Programmer-Tester and the Device supports more than 15000+ devices. - 48 Pin ZIF socket with universal pin-drivers to supports 8-pin to 40-pin DIP package device - USB Interface to Laptop & PC - High speed programming, Cost effective Hardware and Flexible Software. We are leading manufacturers, suppliers & exporters of Universal Programmer Tester PR-02 for Eprom Programmer Teaching Labs. Contact us to get high quality designed Universal Programmer Tester PR-02 for Eprom Programmer Teaching Labs for schools, colleges, universities, research labs, laboratories and various industries. We accept bulk orders for government tenders in all countries around the globe. 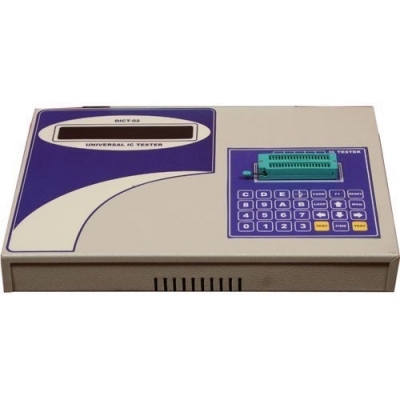 For similar products visit at main page of Eprom Programmer & Programmer Tester.